Great experience with Jesse and Clint. Super smooth and easy to work with! 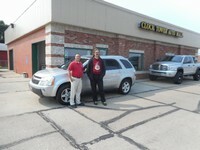 I just purchased a 2011 chevy equinox from clock tower. 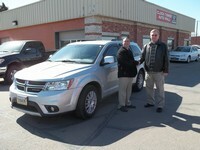 This is the 3rd vehicle I have purchased from Jesse Bordy. This is my second from clock tower. I love car shopping with them. 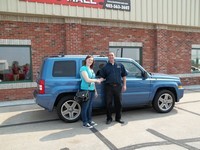 All of the dealers are super easy to talk too and go above and beyond to make sure you are getting the best deal. I absolutely love my new car!!!! Always a nice selection of cars. These guys treat you right. If they don't have what you want they will find it. This purchase makes number 6 at clock tower auto for me. I wouldn't go anywhere else. 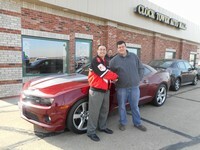 I cannot say enough great things about the guys at Clock Tower Auto Mall! I recently purchased a 2011 Dodge Challenger from them and they honestly made me feel like family. I realize that most dealers would in fact try to act that way, but I could tell it was absolutely sincere. I drove up from Norfolk by myself to purchase the Challenger. I would have had to arrange a way to get my old car back to Norfolk, but they offered to get it back home for me. They took care of that detail of which I considered a big deal, and I didn’t even ask; they offered - how cool is that? The car is outstanding by the way, and was a fantastic deal! 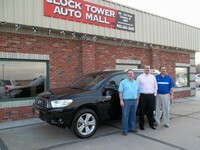 You can’t go wrong doing business with these guys - Clock Tower Auto is the BEST!!! "Better than expected ! " 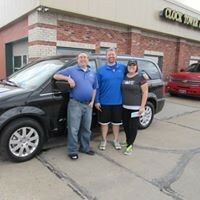 I recently bought a suv from clock tower Auto mall. My experience with Jesse was Excellent ! I bought a jeep suv )sight unseen just pictures over Internet) and Jesse describe the vehicle perfectly. He even took the time to face time the suv for me . I had some bad experiences in the past with consignment dealer but let me tell you that Jesse really hit it out of the park! He didn't bs me and took the time to go over every detail. 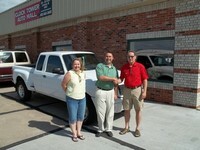 Thank you clock tower auto mall and Jesse! I look forward to doing more buisness in the future ! I everyone else , trust me you will not be disappointed !!!!!! "Third time my children and I have bought vehicles from Clock tower. Not only was the staff amazing but it was nice to be able to have them listen to your needs and steer you towards the vehicle that meets those needs. 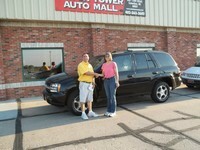 I would not change anything about the vehicles, the financing, and the staff. The whole process was flawless. Thanks Clock Tower!! You have customers for life." New car! Well, new to me. 2005 Chevy Equinox. I'd post pictures, but my phone is being stubborn. 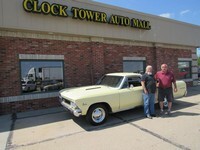 Several days ago I went into Clock Tower Auto Mart here in Columbus, and spoke with Jesse Bordy. My former car worked, but was old and starting to fall apart. I'd rather spend money paying for a nice car than paying to fix an old car. Started showing me a 2012 Malibu LT. A NICE car, very posh. But, according to the bank, too expensive, they want a co-signer. Tried going thru a program at work, they dithered around a few days before saying pretty much the same thing. I'm still a little disappointed didn't work out, but honestly was the car I -wanted-, not what I -needed-. Went back in on Friday and looked at the Equinox. Not as many fancy features as the Malibu, but a lot more power, more room, and about half the price. I'm not sure 'giddy' quite applies, but I'm pretty happy. I dealt with Jesse and Clint. They did everything possible to give me my dream car! Awesome people to work with. Emailed the website and Jesse got to me right away. We looked for a while for the perfect muscle car. Clock Tower Auto had the perfect car for us. Friendly staff and the best service anywhere. Today I believe faith in humanity is restored. When you think "no pressure" then you need to think of Jesse & Clint. They sat down and listened to every word I had to say and they had a complete understanding in my financials. 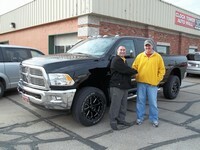 The entire clock tower staff worked with me until they found every favorable route to help me get into my new dodge. After all they did for me during this stressful times they took an extra step and delivered my truck to me at home. Thank you all very much, I will most definitely recommend clock tower auto mall to all of my friends and family. "That was great" Had a very good experiance. Jesse understood what I was looking for and found the perfect car. Overall had a great experiance. Thank you very much. 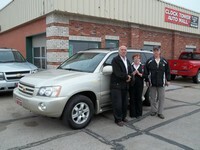 If you are looking for a good vehicle with great service shop at Clock Tower. All of the guys were great, made us feel like family. 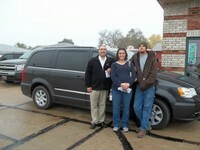 Jesse was our salesman, thank you!!!!! Would definitely go to Clock Tower again for next purchase. 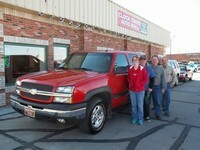 Very Happy Couple from Columbus, NE | All we can say is thank god for Jesse and the rest of the staff at Clocktower Auto. My wife and I have been searching for a second vehicle for 4 months now. Everywhere we went I couldn't find anything that lived up to what I wanted. Then we were looking at their website one day and there it was. The perfect vehicle. Thank heavens we finally found a car that has everything I wanted. 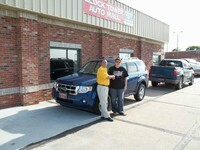 Thank You Jesse and the rest of the staff at Clocktower Auto. 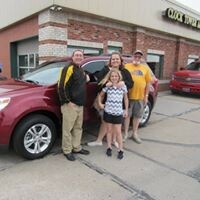 Carol from Columbus NE | When I wanted a different car I went in and they had me test drive the Ford Escape they had on-hand. I wanted different features so I looked at MANY cars on-line and found the one I wanted. They brought it to Columbus and I was able to get a great price and still buy it locally. Jesse was a no pressure salesman and made me feel comfortable. I would recommend Clock tower anyday!! Oh yes I LOVE my new car!! Meagan from Norfolk, NE | I had been looking at cars for awhile and came across this one on the internet. My parents live in Lincoln so when my dad came down for a weekend I had him stop and take a look at the 2007 Jeep Patriot that was listed on Clock Tower Auto Mall. My dad and I then went about a week later to look at it again We appreciated Jesse's patience with us. Instead of showing the car to both of us Jesse took the time to show the car to me. The time taken to show me how to work all the extra gadgets in the vehicle is above and beyond what I expected. Your advice on how to get me into lower payments by having my dad co-sign to save me money is invaluable. My dad wrote, "She has been saving for a vehicle like this for a long time by working two jobs while attending college. 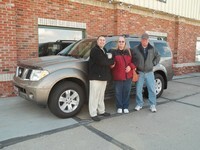 Being able to purchase this vehicle rewards her for all of her efforts and I like the safety features of this vehicle. I am sure she will keep it for a long time." 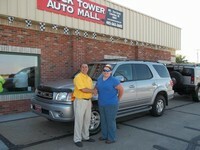 Toyota Lover from 51401 | I just purchased my new to me Toyota Sequoia from Clock Tower Auto Mall. I delt with Jesse and was very impressed with EVERYTHING! They were quick, very courtious, and had a very nice facility. I would deal with them in a heartbeat. 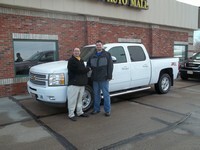 Trucks from Bruno, NE | We received great service and a fantastic vehicle!!! 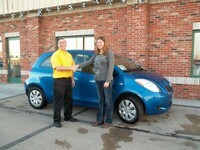 Harriette from Columbus, NE | This whas the most enjoyable experience in finding a car. 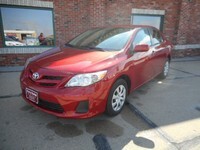 We have been looking for over 6 months and finely found just the right car for the price here. Jerry was very friendly and knowlegeable. We will be back when we start looking again. Going to start here!! My truck broke down and really needed a car so with in 2 hours of emailing Clock Tower Auto Mall i got a call on this 300 and by that night I had it. So really helped me out! This is my third vehicle I have bought from Jesse. They have always treated my very well here and that is why I keep coming back. Thank you guys for making me feel at home and making the car buying experience amazing as always! Thank You Clock Tower! 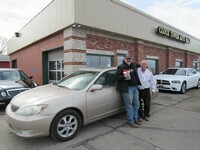 Jesse Bordy and John Adamy are the best at taking care of all our auto needs. I met them when they were employed at another dealership and had to follow them on their own adventure. They took care of all the little things. I was comfortable and had no worries. John takes care of the people and IS NOT out to get rich quick. They are Honest! Thats what makes me a repeat customer. They helped me find exactly what I was looking for and I was not pressured in any way. This is a super place to buy a new auto or truck. They are very nice to work with you to find you something you what. We will tell all our friends to come here to get something new. 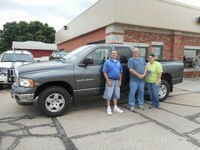 I wanted to say that John, Jesse and the whole Clock tower Crew did and excellent job locating my new Ram truck and getting me the best deal available! I would recommend all of my family and friends to them! Great job guys! Eric T from Lincoln, NE | Jesse and Clint are just amazing. 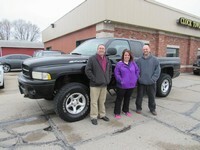 When it comes to customer service, Jesse and Clint went above and beyond my expectations. Jesse took the time out of his evening to answer any questions I had, whether it was with a phone call or text message. Quality of vehicles on the lot is wonderful. I would recommend Clock Tower to anyone looking a purchasing a used vehicle. I made an hour and a half drive to do business with Clock Tower and I would not hesitate to do it again. Thank you Jesse and Clint! 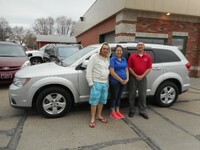 Tina from Columbus, Nebraska | I talked to Jesse Bordy about the type of vehicle I wanted, and he found me the PERFECT vehicle. If I wouldn't have liked any of the vehicles they had, they would look for one for me that I did like, which was awesome to know, because I have never had a dealership that would do that before. They were so friendly and felt like I knew them for years (which I had just met them.) I would HIGHLY RECOMMEND buying your vehicle from Clock Tower Auto Mall. 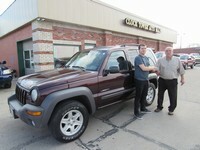 ShoeMan from Columbus, Ne | I just purchased a used Mercury Mountaineer from Clock Tower Auto Mall and it was the easiest time I have had buying a vehicle. There was no hassle and they gave me a great deal. 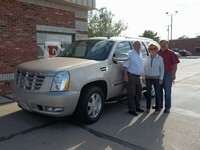 Author from Hadar, NE | We have shopped for used cars several times in our 25 years of marriage. This time was by far the easiest. I knew I wanted a Kia Soul in the color Alien. I kept waiting on a local dealer and had stopped in a couple times to the point I felt I was being a bother. I decided to see what I could personally find online. Within 5 minutes I found this car in Columbus. Within 10 minutes, Jerry called me back. My husband and I checked it out that same evening. The entire office was friendly. I stopped back the next day with our trade in title and to pick up the CD's I'd left in the trade in. They were just as friendly. What great people to work with. I had read the testimonials before we went out of town. They were busy with other customers being treated just like we were. Randy from Fairfax, Mo. | While searching for just the vehicle I wanted I came across such a vehicle on the lot at Clock Tower Auto Mall. 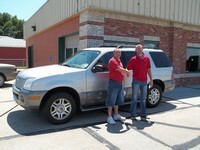 Contacted Jesse and made arrangements to visit the business and inspect the vehicle. 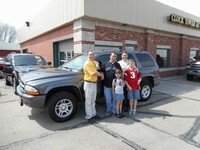 I had to travel 3 hours to get there and was pleasantly suprised that the vehicle was exactly how it was presented. Wonderful, no pressure buying experience. All the guys were great to deal with and visit with. Would highly recommend anyone to give these guys the opportunity to help you with your vehicle needs. Great bunch of guys to deal with. 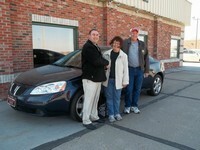 Angelsunaware from Platte Center, NE | They were so easy to work with. Showed us exactly what we wanted and did not show us anything else. Not pushy and showed us that we could trust them. Took almost an hour showing us the gadgets on the car and how to run them after we purchased the car. Even set up the synch with my phone. Had a question the day after purchase and they took care of it quickly. Got to know each person in the dealership. Beautiful car, at a good price. 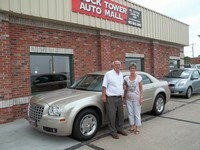 We will come back to Clock Tower Auto Sales next time we need a car. 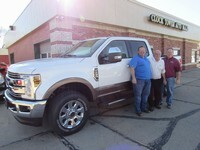 Banker from Columbus, NE | The part of my experience that I was most impressed with is that these guys went through the extra effort to find me the car I wanted, and to bring it to their lot for me. I was not limited to what I saw, but rather limited only to what I wanted. 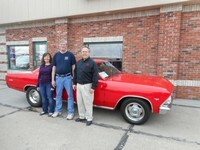 It worked great, my wife and I got a fantastic car, and we could not have done it without Jesse, John, Jerry, and Clint. Thanks guys. 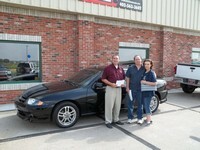 Pontiac Gal from Columbus NE | Saw the ad with the car I was looking for. 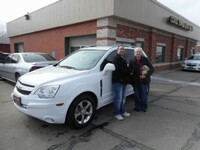 Check out the car and with a few, very friendly, phone calls purchased it the next day. No high pressure. Everyone friendly and a pleasure to work with. Jesse and the guys made it easy and fun. They are there after the sale. Thanks Jesse. 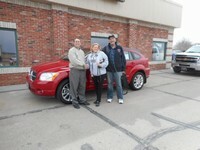 Shelby from Rising City, NE | I contacted Jesse and within 2 weeks he located the specific car/color I requested and got it delivered from out of state at no extra charge. 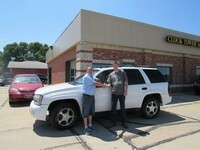 Clint took care of the finacial arrangements and even dealt with my insurance company for me. Best experience I have ever had buying a car. Even though they have many customers they treated me like I was their only one. 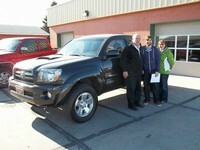 Brandon from Columbus, NE | I recently just purchased a 2009 Toyota Tacoma and I am very happy with the purchase anf overall experience at this dealership. 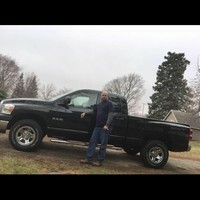 Customer service was great, they worked with me to get the truck into my price range and the finace and paperwork portion was quick and easy. 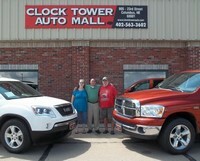 Clock Tower Auto Mall of Columbus, Nebraska strives to stand out from the normal car dealer atmosphere. Our customers are treated as though they are the only person in the world buying a used a car. We make sure that all of our customers are treated well and leaving know that their needs are our number one concern. 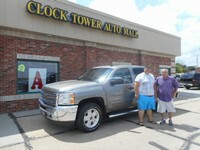 Here's what some of our Clock Tower Auto Mall's happy customers have had to say.